The Sense8 TV show has been cancelled. There will be no season three of the Netflix sci-fi drama from Lana Wachowski, Lilly Wachowski and J. Michael Straczynski. 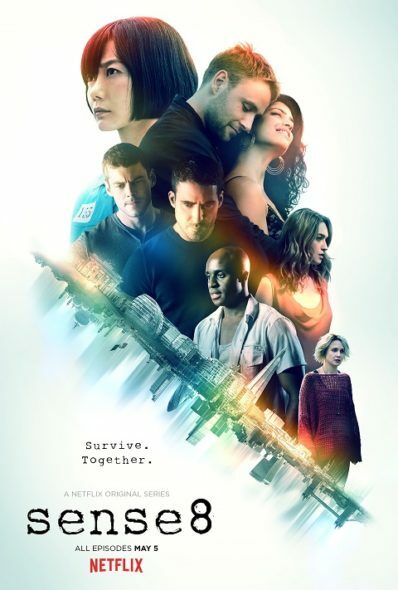 A Netflix TV series, Sense8 stars Doona Bae, Jamie Clayton, Tina Desai, Tuppence Middleton, Toby Onwumere, Max Riemelt, Miguel Ángel Silvestre, Brian J. Smith, Freema Agyeman, Terrence Mann, Anupam Kher, Naveen Andrews, and Daryl Hannah. The series follows eight people from around the world, who share a birthdate as well as a psychic connection. After the actors’ contracts lapsed, a couple of months ago Netflix reportedly reached out the core cast for a third season, but apparently, things didn’t work out. The second season of Sense8 dropped to Netflix on May 5, 2017, nearly two years after the series first premiered. What do you think? Have you watched the first two seasons of Sense8? Should it have been cancelled or renewed for a third season on Netflix? Let us know below. I just finished watching season 2 and would really love it if there are more seasons to come! It was awesome and it would be a shame not to continue! Ok. I hated it. a mishmash of nothing and thats from the Guys that created The Matrix. I REALLY LOVE THIS SHOW !!! TV Shows get canceled all the time, what if this show wasn’t making enough money to cover its production? Since when commercial entertainment is Charity? One series that was not like anything else. The best series of this year. Why Netflix. Now I don’t need to pay for the service any more. Guess it wasn’t “the best”, shows canceled when they stop making money. I love this show terribly sad by this news. This is really sad news. I loved this show and the topics it explored. More like this please. please this is an awesome show it deserves to be continued and it has a great story and besides i want them to deal with BPO…i loved the fact that they stopped playing safe….so please BRING IT BACK…..why do you guys keep cancelling the interesting ones?…..please do something about it…..where can i make some noise am not on twitter…. Sense8 is the beginning of something new. It is exquisite and essential and ground breaking. We need a new innovative leader in streaming to step up and take on season 3 of Sense8. Amazon? You Tube? This is their loss, your win! Here! Here! Jennifer! I hope You Tube picks this show up. I hate that Netflix left us with a cliffhanger. It seems like Netflix is always canceling the good shows! What’s the real truth on the cancellation of sense8.That I loved by the way.at my age very few shows catch my attention.so who was at fault Netflix dragging it’s feet.or the actor’s agents dragging their feet.? Smells to me like the agent’s smell!! Can’t believe it’s been cancelled. Loved watching this and just watched the last episode last night. Cliff hanger ending. Please bring it back. Oh they had Season 2? Next time don’t wait 2 years. NO…. I love this show! It is so original, so well cast. I have rarely gotten so emotionally involved in a TV show. And I’m no spring chicken, pushing 70 here. If you’re short on cash I can think of several OTHER SHOWS to cancel.